Tags: Committee, Day at the Capitol, Opioid, State Budget, Tax, Washington D.C. The First Two Weeks of Legislative Session are in the Books! A later start to session compressed the timeline for the legislature to complete its work, so it has been a jam packed first two weeks. The House Health & Human Services (HHS) Reform committee held a hearing on Representative Dave Baker’s (17B – Willmar) proposal to institute a new tax on all prescription opioids sold in Minnesota. Each ‘unit’ (pill, liquid, or patch) sold in Minnesota will have a tax of $.01 multiplied by a certain factor – depending on the active ingredient in that unit – applied to it. The tax does not differentiate between name brand drugs and their generic counterparts. For example, a 10-pill prescription of generic oxycodone (which has a multiplier of 15) would have a tax of $1.50 applied to it ($.01 * 15 * 10 = $1.50). Currently eight other states are considering similar proposals – including Kentucky and New York. The funds raised from this new tax would be spent in several areas including helping local governments deal with social services challenges brought on by opioid addiction, funding treatment programs, and expanding provider education and public awareness. Full language of the House bill, as amended in committee, can be found here. Several testifiers spoke in support of the bill including former DEA agent Joe Rannazzisi, police officers, parents of children who died from overdosing, and medical practitioners. Legislators were very engaged in the hearing asking questions about the bill and how it would get help to the people who need it. Ultimately no action was taken on the bill by the committee. The author and legislative supporters will continue to work on the bill before coming back to the committee for a vote; the chair gave no indication when this would be. A similar proposal in Senate, which received a hearing last year, is currently awaiting action. Leaders in both chambers have said they want to pass something this year addressing the opioid issue – but neither have committed to passing this new tax. We anticipate a package of proposals being brought forward later this session including prescription limits and funding for treatment & prevention. We will keep you informed as this issue progresses. While the Medical Alley Association typically opposes unfairly targeted taxes on our members, we are committed to working with legislators to deliver real solutions to this crisis.  Medical Alley is home to the expertise and leadership that can bring new ideas and solutions to this challenge. We’ve already hosted a legislative roundtable that showcased Medical Alley expertise in pain management without opioids and we will continue to bring insights and information to legislators on this issue. To see the Medical Alley pain management roundtable, please visit our YouTube channel. Please bring us your solutions as Medical Alley aspires to lead this important conversation! Please let us know if you have ideas or would like to visit with legislators on ideas for fighting this epidemic. This past Wednesday the Department of Management and Budget announced its February economic (budget) forecast. The news was positive – the forecast showed a $329 million surplus, up from a $188 million deficit in the November forecast. Legislators will use this number to put together any supplemental spending or tax bills during this legislative session. Notably, this budget forecast does not account for any changes made to conform Minnesota tax code to federal changes. This is because legislative action is required for conformity; so no legislative action means no impact will be had on the state budget. Leadership in both the House & Senate, as well as the Governor, indicated a desire to conform to some or most of the federal changes, so the expectation is that something will get done. Conformity will result in more revenue for the state (via higher taxes) – but it is anticipated that most or all of these dollars will be reallocated towards off-setting these increases through other tax changes. We will be keeping a close watch on any tax changes and will keep you informed on this throughout the legislative session. Next Monday, March 12, is Medical Alley Association Day at the Capitol! MAA members will be meeting with legislators from both parties as well as key staff in the Executive Branch. Several members will also be exhibiting their products in the basement of the Capitol so legislators and members of the public can see some of the innovative work being done in Minnesota’s Medical Alley. It’s not too late to be a part of MAA Day at the Capitol! Just get in touch with either Bobby (bpatrick@medicalalley.org) or Lilly (lmelander@medicalalley.org) and let them know that you’d like to meet with your legislators on MAA Day at the Capitol. Legislators really appreciate when constituents come and meet with them at their Capitol offices – so please join if you can! This past week Shaye Mandle & Bobby Patrick traveled to Washington D.C., as part of the AdvaMed Capitol Hill fly-in, to advocate for the Health Innovation and Care Industry. We thanked Minnesota’s congressional delegation for their support in successfully passing another 2-year delay in the implementation of the Medical Device Excise Tax, continued to promote a full repeal, and discussed the need to take a serious, yet careful, look at ways to enhance patient care delivery. MAA met with Congressmen Paulsen, Emmer, and Lewis, Senators Klobuchar and Smith and key staff for others representing Minnesota’s Medical Alley. 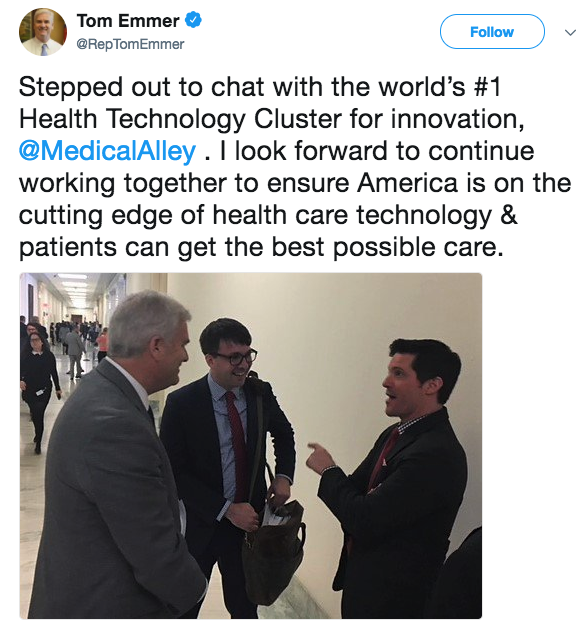 A special thanks to Congressman Emmer for his Twitter post acknowledging the great work done in Medical Alley! It was a very successful trip and we look forward to continuing to work with our congressional delegation to keep them engaged with you and to prioritize Minnesota’s Health Innovation and Care industry. Each year leadership in the House & Senate agree on deadlines for committees to complete their work. Traditionally there are three deadlines. The first deadline is for a policy bill (i.e. no money is spent) to be heard and passed by one committee in either the House or Senate. That is, if a bill hasn’t been heard and passed by a committee in either body, then no action can be taken on it this year (absent extraordinary circumstances). The second deadline is for a policy bill to be passed through all committees in both bodies – otherwise no action can be taken this year. The final deadline is for is for finance bills to be through all committees. This is more applicable in a budget year (typically odd-numbered years, when there are several budget bills, such as HHS, Education, etc. ), but the legislature often does one, larger, supplemental budget bill in the non-budget year (typically even-numbered years, such as this year). The deadlines do not apply to bills in the Rules, Ways & Means, or Taxes committees. The state constitution requires the legislature to adjourn by no later than Monday, May 21, 2018. The Medical Alley Association Government Relations team will be watching legislation important to you and making sure all appropriate deadlines are met. The memo from House & Senate leadership announcing the deadlines can be found here.